I wish I had a better reason for why I haven’t posted in almost five months. I could tell you about how my summer with the kids was busy, how I spent more time focusing on prepping for a charity bike ride, and how lots of travel has distracted me. But those are all pretty flimsy excuses that mask the real issue I’ve been facing lately: Runner’s Block. As running bloggers, we are quick to post when our training is going well, when we’ve met a particular goal, or after a successful race. Our blog becomes a non-stop highlight reel of PR after PR, inspirational pep talks, and enthusiastic praise of this sport we love. When we do post about the trials and challenges of running, it’s often as part of a story about how we overcame adversity and came out on top. Our words bubble forth as we do our best to convince everyone to join us in this blissful state of achievement and satisfaction. Once you get swept up in the running culture, it’s easy to feel like you should be “up” all the time. If you call yourself a runner, you should love running all the time. And if you aren’t running, there should be a clear-cut reason — like major illness or injury — which will only serve to fuel the fire and make you more motivated as you begin your triumphant return. Cue the comeback soundtrack. Looking back on my own blog, I can see how I perpetuated that pattern. I fell into the trap of presenting the airbrushed version of what being a runner is like, and when I felt like I wasn’t living up to that ideal image, I stopped writing. I haven’t even finished editing the second part of my marathon recap, which was an AWESOME race, because I feel guilty about posting it while I’m barely eking out a few miles a week. So, here’s the truth: I haven’t been running very much. I decided to put other priorities first, and I let racing sit on the back burner for a few months. Without the added motivation of having a goal race, I slacked off and gained a little bit more “fluffiness” than I would’ve liked. I still liked the IDEA of running, but it didn’t feel very good and wasn’t very much fun. I’m slowly getting back on track, but I still feel like I’m struggling with runner’s block. Most days I run only because my head tells me that I should. I still find myself pining for the good old days when I ran because I WANTED to, and because it made me feel good. I’m not sure what it will take to get that feeling back, but I’m determined to keep trying. *Have you experienced runner’s block? *What do you do to find (or keep) your motivation? It’s almost 1:00 a.m. and I should’ve been in bed hours ago. I also have work to finish and a camping trip to pack for. But I tonight I saw the premiere of “Spirit of the Marathon II” and after seeing those great stories I’m determined to finally sit down to write my own! Rest assured that I’m not going to write a full recap, complete with 26 miles of splits and a breakdown of exactly what I ate and when. (I couldn’t even if I wanted to because the GPS for my RunKeeper app went nutso during the race … Pretty sure I did NOT run 29 miles!) But even writing just the highlights will take some time and probably two posts. So if you want the short version — spoiler alert — here it is: I finished a marathon. It was awesome. If you want the longer version, read on! “Before” Photo – Looking happy and a little scared! As I think back on my Flying Pig marathon experience, it’s not the black-and-white numerical data that I remember. I can’t recall what happened at each individual mile. There are even some pretty large chunks of time that are a total blur. But sprinkled throughout the race are several key moments, so clear in my memory, kind of like my own personal highlight real. THE START – I had been so preoccupied with race preparations and the frenzy of getting to my starting corral that my brain was too busy to comprehend what was happening. Suddenly I found myself standing there, surrounded by a sea of runners, facing a beautiful sunrise over the start line and it hit me like a ton of bricks: This is IT. After all of the work and sacrifice, joy and grief, I am finally HERE … And I started to cry. Seriously? Already? Sheesh. But as we moved forward, I snapped out of it. I wiped the tears from my face and held my head high. I had a monumental task to accomplish and I needed to focus. So it began! THE SIGN – I loved reading all of the signs along the course. Some were funny, some were encouraging, some were even a little suggestive. But the one that stuck with me the most was held by a woman I saw around mile 2. She was sitting on the curb with a poster propped up in front of her that said something like, ‘I fractured my hip training for this race. Finish for me.’ For a few seconds I actually thought about trying to turn around to go back and give her a hug, but it was so crowded I would’ve gotten trampled. Sign-lady, if you’re out there, please know that I thought about you repeatedly whenever things started to get tough. Thanks for the extra motivation. 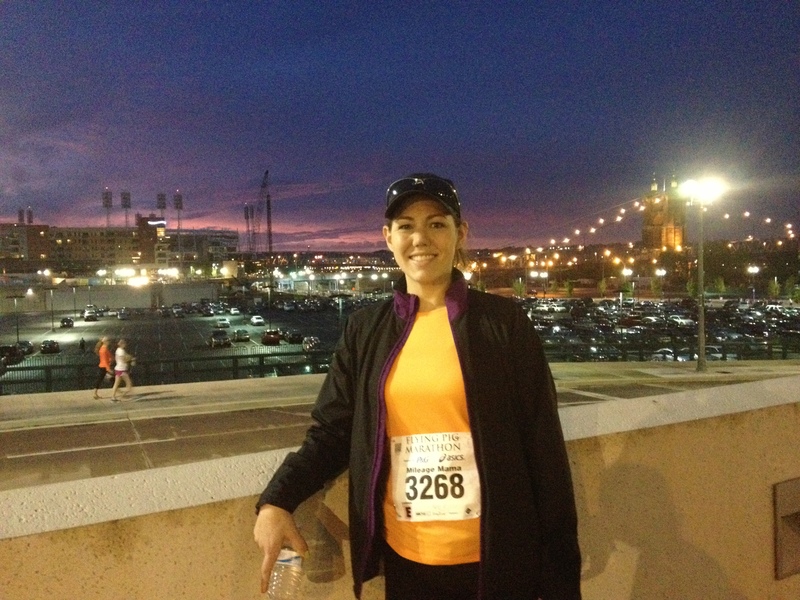 THE VIEW – I had studied the course enough to know that I should anticipate an uphill first half, but since I’m not from Cincinnati, I didn’t know exactly what to expect. I tried to focus only on the road that I could see immediately in front of me, not worrying about what still might be ahead. As I rounded a bend around mile 7, I was practically smacked in the face by an amazing view down over the park and back onto the city we had just left. It was astounding to see just how far I already climbed, especially compared to how good I felt, and I knew that after only another mile or so the toughest hills would be done. I was flying high, literally and mentally! THE EXCHANGE – At some point, I decided to calculate whether I had brought along enough fuel for the duration of the race. I am normally pretty good at math, but something about running turns my brain into scrambled eggs and I started to worry that I hadn’t put enough energy food in my belt after all. And the jacket I had tied around my waist was annoying the snot out of me. Mentally, I was just at the point of starting to slip a little. 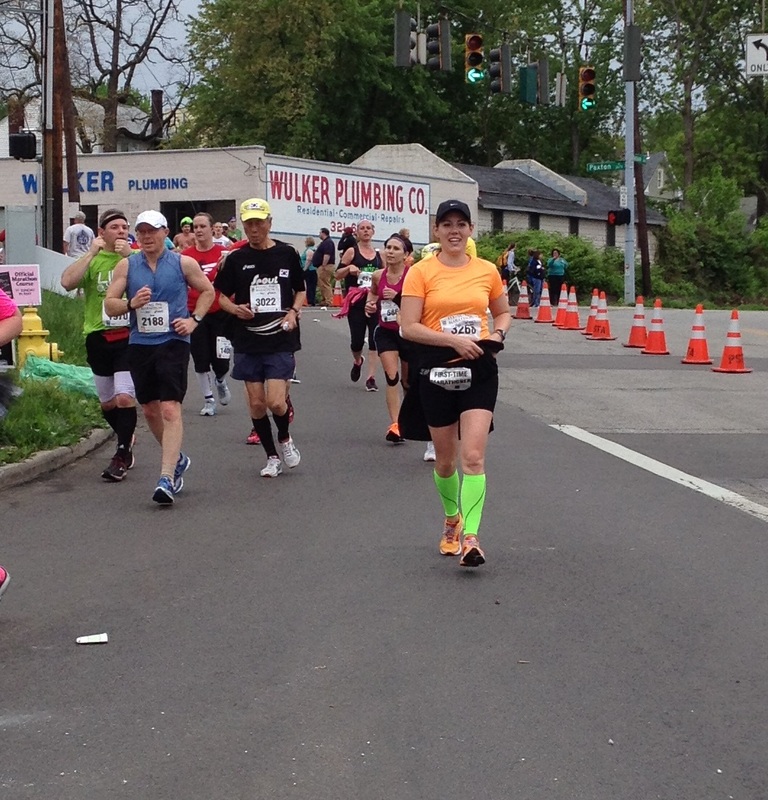 THE HIGHWAY – After winding through some scenic, fun, lively neighborhoods, it was time for a reality check at mile 18. The course takes you back toward downtown along the shoulder of a highway, so you are combining mind-numbing scenery, little crowd support, and mileage that is starting to add up quickly. Today I ran my slowest 5K ever. In fact, I hesitate to use the word “ran” because it was more like a slow trot. I came in last place in my age group. But none of that matters … because I won. 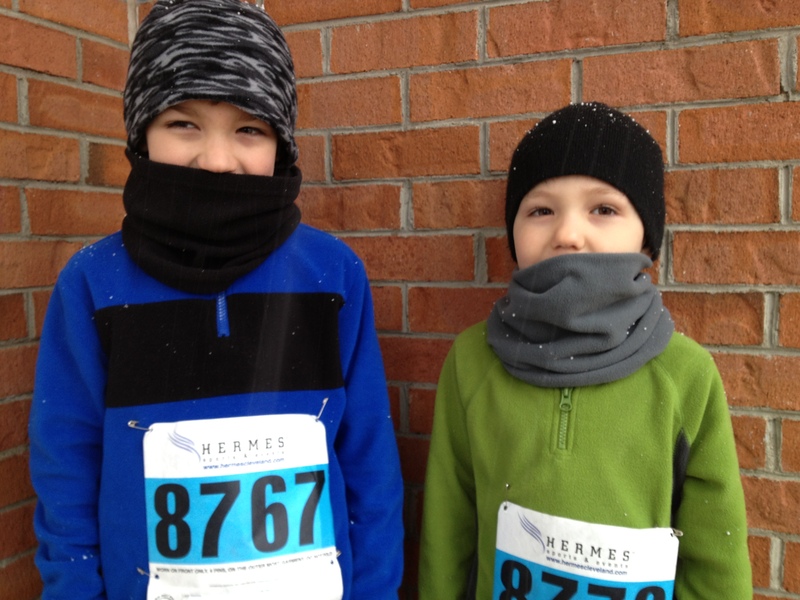 My boys, ages 4 and 7, have come to quite a few races to cheer on the grown-ups. They love the races that have kids’ activities, snacks, and prizes. (Especially prizes!) Somewhere along the line, they decided that wasn’t enough, and that they should actually RUN in the race — And not just the “fun run” or the kiddie distance, the actual 5K. Besides running with them, my husband and I also talked a lot about how going to a race is not about beating other people, or winning a medal, but is about doing the best that YOU can do. (I knew we were getting through to them when I went into their room one night and heard one of them mumbling “personal best” in his sleep.) Above all, I wanted their first race to be a positive experience. Something they would always remember, and hopefully would want to do again. 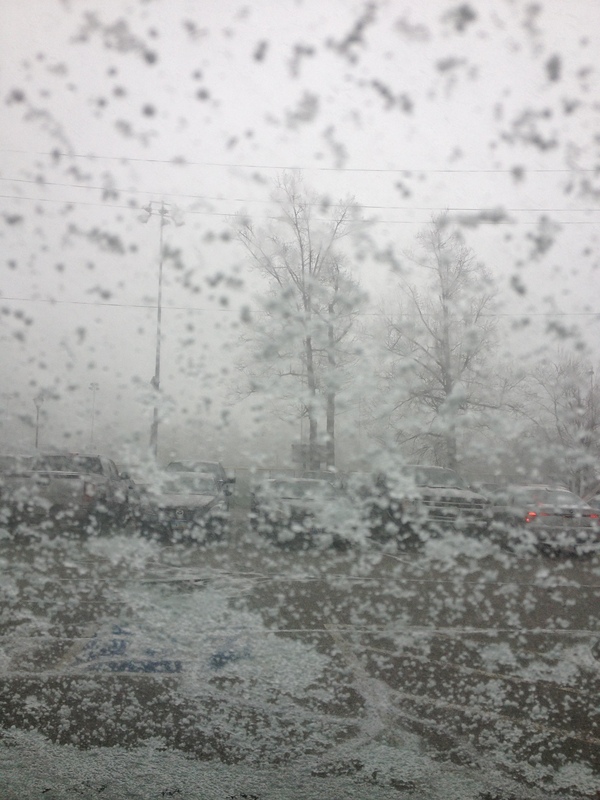 Unfortunately, as we picked up our “Jog Into Spring” race bibs, a snow squall sprang up. Seriously?!? We were being pelted with tiny balls of ice and I thought for sure the kids would complain. But we bundled up and headed to the start line. Thankfully, it stopped snowing and stuck to being “only” cold and a little windy. All bundled up and ready to run! Looking out the car window before we started … yikes. My husband ran with Boy #1 so that they could go a little faster. I stuck with Boy #2, who started off at a nice, steady, but sloooooow pace. Once the 1-mile walkers peeled off at their turn, I realized we were at the very end of the runners — what a strange feeling! Then we came up to our first mile marker, and we were already getting passed by the race leaders heading in the opposite direction. I did what I could to keep my boy focused and steady, but by the second mile marker, the wheels were starting to come off. Bringing up the rear, just in front of the walkers. 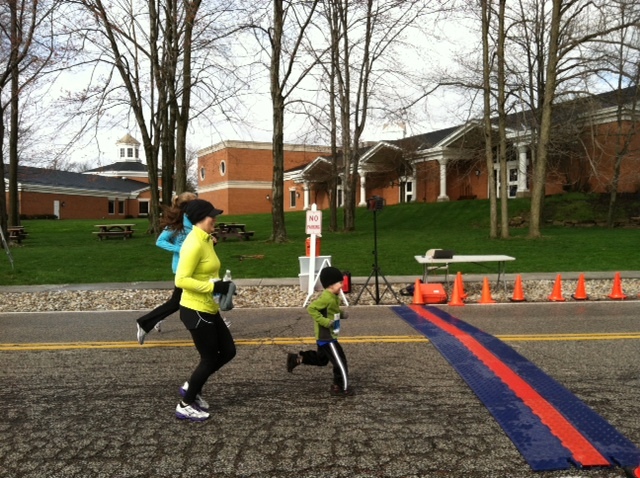 My mom and a friend did their best to make it fun for him, running ahead and letting him catch up to “beat” them. I bribed him rewarded his efforts with jellybeans. I even resorted to singing to him. (I’m sure the complete stranger that had fallen to the back of the pack with us was very amused by my a capella rendition of “Eye of the Tiger.”) We managed to avoid a full-blown meltdown, but that third mile was tough. All along the way the race volunteers and police officers cheered for him. I know they were probably freezing, and since they were basically only waiting for us at that point, I tried extra hard to thank each of them as we passed. Finally, the finish line came into view. Pretty much the only people left were our friends, and the family of a woman who I think accidentally found herself on the course for the 5K instead of the 1-mile walk. (Poor thing!) 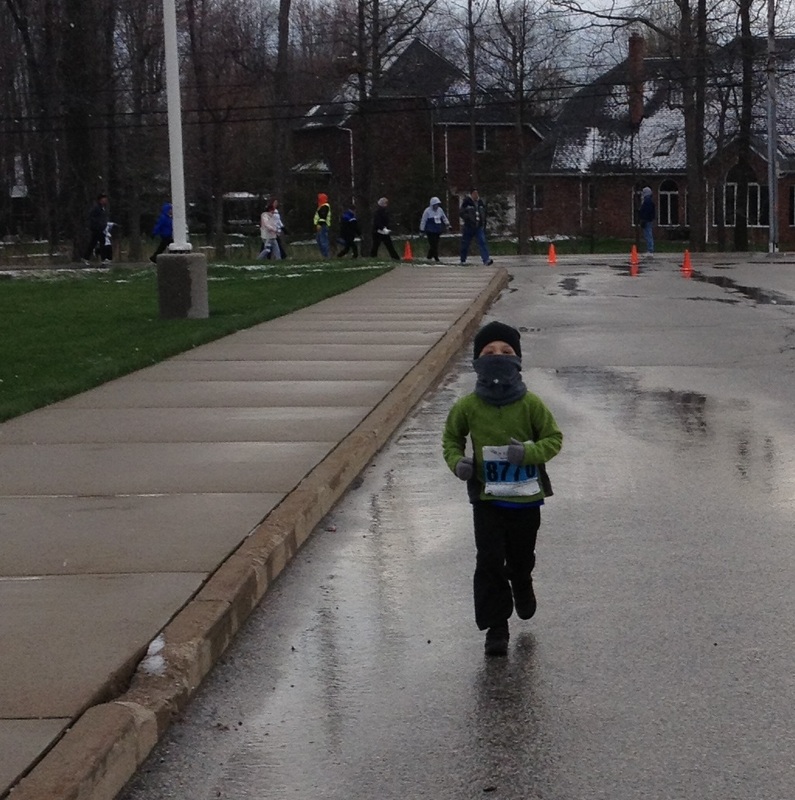 But their cheers were enough to spur Boy #2 on to a strong finish, with a smile on his face. 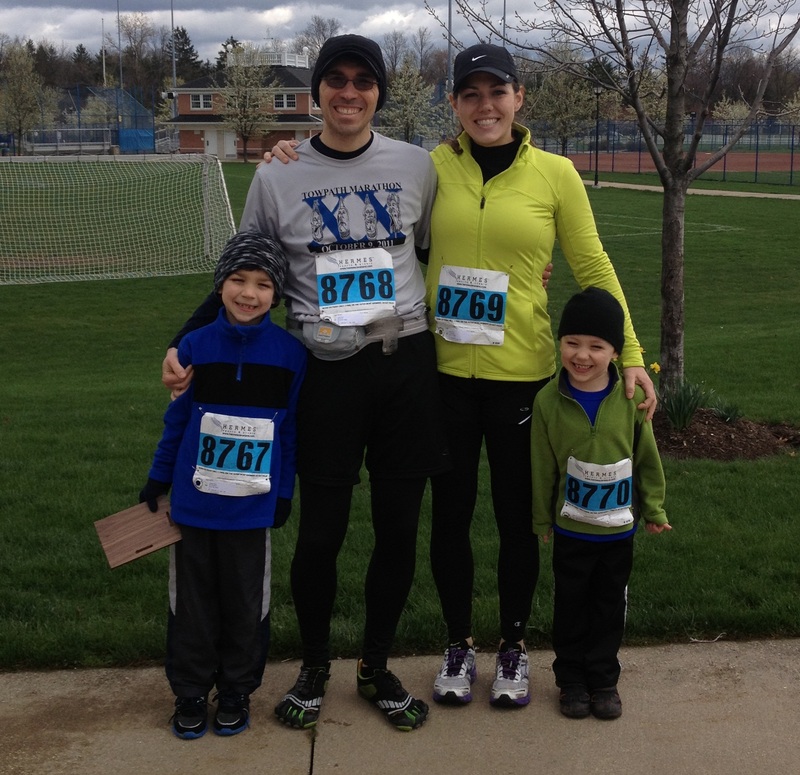 We met up with my husband and Boy #1, who had also struggled a bit through the last mile, but stuck with it. He even snagged an age group award for his efforts! But he was not the only winner today. Plenty of other people showed up, ignored the weather, and finished the race they started. Winners. More people showed up, ignored the weather, and cheered for the participants. Winners. Race staff, volunteers, and police officers helped support us and keep us safe. Winners. And that, my friends, is WINNING. So proud of my family! Over the past three months, as the training has gotten tougher and the runs have gotten longer, I’ve spent a lot of time visualizing what it will feel like as I approach the finish line of my first marathon. Will I feel strong and proud, with my arms raised in victory formation? Will I feel tired and sore, limping my way across in grim determination? Will I smile? Will I cry? Never once in those moments of dreaming could I have imagined something like the nightmare that occurred at yesterday’s Boston Marathon. Runners are used to experiencing discomfort, and even sometimes pain. We embrace it willingly in our quest to run faster or longer or to prove that we can overcome the voice in our head telling us to stop. But our type of hurt is self-inflicted and temporary, a stark contrast to the events of yesterday. It is hard to wrap your head around the fact that someone intentionally turned an area of celebration into a crime scene. My heart, of course, goes out first and foremost to the individuals that were injured and the families that lost loved ones. Their loss is by far the greatest. But I am also sad for the runners. There are those that spent so much time and effort training to qualify for, and then actually run, one of the world’s most prestigious marathons, only to be stopped short of the finish line. And there are those that did finish, but who will forever have a shadow of grief cast over their Boston Marathon experience. As a human being, I am affected by the stories of suffering and loss in Boston. As a runner, it resonates even more deeply. I feel a connection to it, and with my own marathon less than three weeks away, it has been far too easy for my mind to swirl with “what if” thoughts. The question lies before us: What do we do now? We could allow ourselves to get weighed down by the pain and suffering, until we give up and quit. Or we could reach inside and find the determination to continue. I choose to rely on the support of my friends and family, to cling to my faith, and to finish what I’ve started. Please join with the rest of the running community as we keep moving forward, just like we always do … One foot in front of the other. I should be excited. 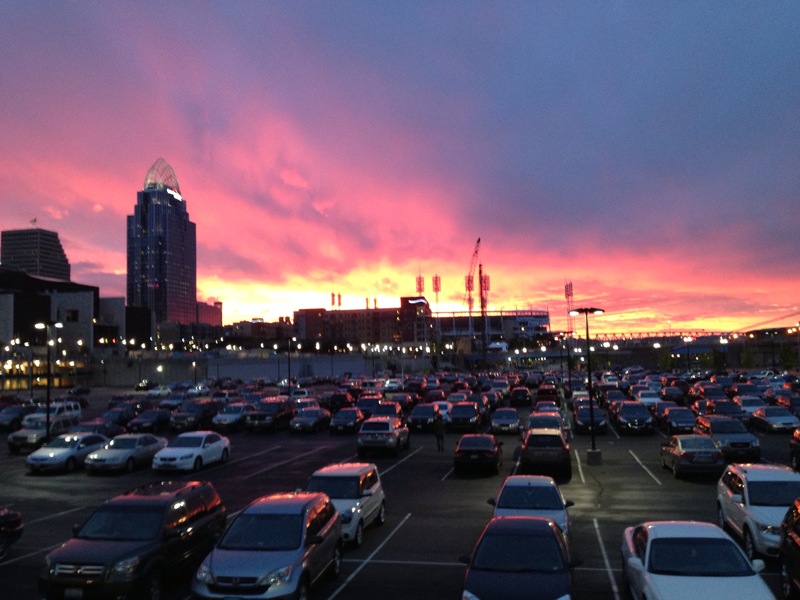 Today is the Indians home opener, a day that Clevelanders look forward to every year. Spring is (mostly) here and the promise of summer is right around the corner. Baseball season is full of fresh hope and playoff dreams, and the Tribe hasn’t managed to break our hearts … yet. But this year’s opener is very bittersweet for me. It brings back memories of a fallen friend, one who was with me through so many moments and memories from seasons past. As kids we watched the Indians play at Cleveland Municipal Stadium. It didn’t matter how many games they lost — and trust me, they lost a LOT — piling into the station wagon for a trip to the ballpark was exciting. We spread out across the deserted rows of general admission, making sure to leave enough empty spaces so that we could bang the empty wooden seats along to the beating of John Adams’ drum. In the mid-90’s, we were amazed at the glorious new stadium and the crowds it drew. (I mean, where WERE all of these people for the 1991 season?!?) But we were excited to have attendance high enough to actually do the wave! 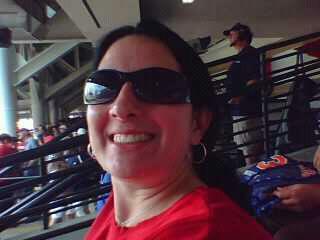 We sat in the bleachers and screamed for Manny Ramirez (her) and Sandy Alomar (me). We rode the wave of playoff excitement, and consoled each other when our World Series dreams were dashed. We kept going to the Jake even after the shiny newness wore off, and we kept calling it the Jake even after the name was changed. (The Prog??? I think not!) We were older and had jobs but we both worked strange shifts, so we went to some of those great midweek afternoon games together. The kind where sitting in a baseball stadium at noon on a Thursday feels like playing hooky, and you feel sorry for all of the office stiffs stuck in their 9-5 jobs. We sat through games where we baked in the sun, froze in the lake breeze, or got drenched in the pouring rain. And we had fun together every single time. We went on a road trip to see the Tribe play in Chicago. We boldly wore our Indians garb into enemy territory, ate their dollar hot dogs, and tried our best to let our team know we were there to support them … even though they lost. We planned another trip to catch a game in Detroit last summer, but it fell through. And now it will never happen. As the players and coaches were heading to Goodyear to start spring training, she lost her battle with leukemia. There is one less fan in Tribe Town this season, one less voice in the crowd. Every time I watch a game, I will miss her. I know that I will still yell and cheer, although my voice will never be loud enough to make up for the loss of hers. I will hold on to the hope of victory until the last pitch has been thrown, just like she did. This season’s for you, Mel. I knew it was coming. I could hear the footfalls behind me on the path. I felt its breath on the back of my neck. The feeling of expectation was heavy in the air, knowing that it was only a matter of time before the other shoe dropped. And then one sunny Wednesday morning, there it was. The run I’d been waiting for: The crash and burn. I’m normally really excited to head out the door and tackle my run, but that morning I struggled to even get out the door. As I drove to the park, I was still fighting the urge to turn around and drive back home. I willed myself out of the car and figured if I could just get started, the miles would fly by and I’d be well on my way to covering my scheduled 18 miles. I was wrong. I warmed up, planning to start with my usual 5-minute run/1-minute walk ratio. Except I couldn’t even run for 5 minutes. 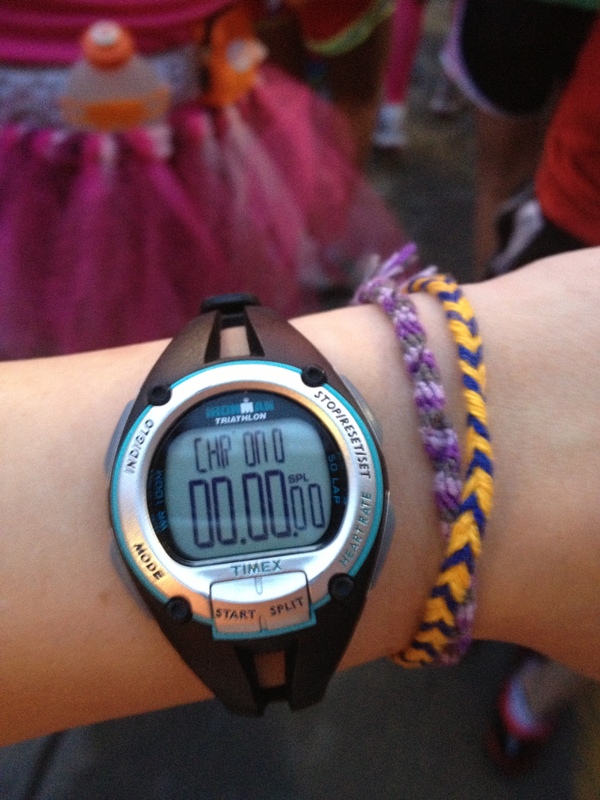 In fact, I barely made it for 90 SECONDS before I felt like I couldn’t run one more step. There really wasn’t anything wrong. The weather was fine, I wasn’t sick or injured. It just felt like someone had filled my Mizunos with concrete, and each step took triple the normal effort to execute. I tried another running segment. I checked my watch, confident that I was closer to 5 minutes this time. Nope, 1:45. This process continued for another mile or so, and I never made it past 2 minutes of continual running. My body was not cooperating, and on top of that, I just didn’t feel like running. I tried changing my plan. Instead of a long, steady run, maybe I’d try some hill repeats to get myself pumped up. Normally I love the feeling of accomplishment after reaching the top of a tough climb, and it totally charges me up to keep going. But as I forced my way up to the top of my third repeat, I wanted to cry. This was not fun, and I didn’t want to do it any more. So I turned around and slowly made my way back to the car. The walk of shame. 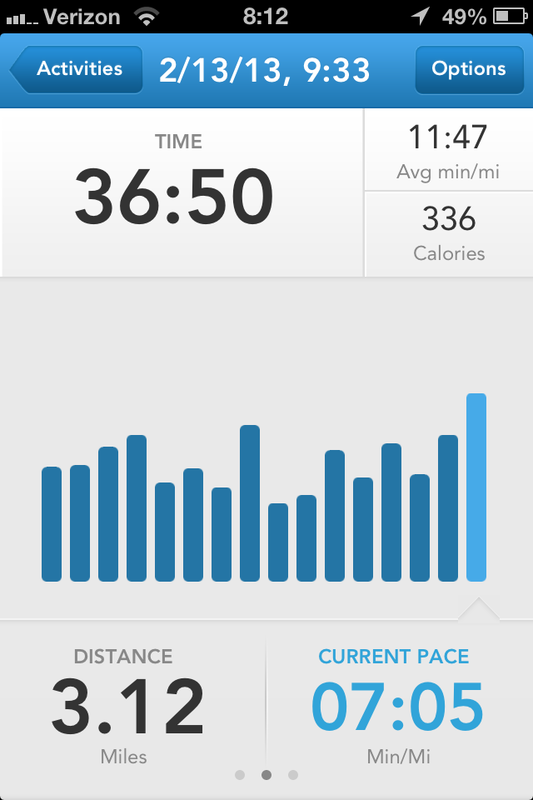 My “crash and burn” workout … Three years ago this would’ve been my race pace! On the way home, I wallowed in the disappointment of not completing my scheduled workout. I felt like a failure. And I almost slipped into the “this missed opportunity is going to ruin my entire marathon training plan” kind of thinking, which is pretty ridiculous. First, throw yourself a 5-minute pity party. Allow yourself to be mad, sad, disappointed, whatever. Just get it all out and be done with it. Second, get a little perspective. This is a great time to look back at your training log. Maybe you didn’t go as fast or as far as you’d have liked today, but it’s probably only a small piece of what you’ve done over the past weeks, months, or years. Just a tiny blip on the radar screen. Third, learn a lesson. Take an honest look at why things might’ve gone wrong. Did you fail to fuel or warm-up properly? Have you been properly recovering after your workouts? Are you being realistic in your expectations, based on your current circumstances? Most importantly, what can you change for the future? In my case, once I took a step back and looked at it, I figured a few things out. I didn’t get my running gear ready the night before, so I wasted way too much time and energy wandering around the house trying to get myself together. I’d flipped my schedule around and tried to do two long runs close together. And I spent the day after that run in bed with a sore throat and stuffy head. So my body was probably trying to tell me to give it a rest and allow it to fight off the germy invaders trying to storm the castle! Still smiling at the end of my first 20 mile run! I made a few notes in my training log, and life went on. The next week I raced a 5K with a new PR time, taking more than 40 seconds off of my previous best. Later that month I ran my first 20-mile training run, and I’ve done several more in the 15-20 mile range. That one disappointing run was, in fact, just a tiny blip on the radar screen of my marathon training. Runners, if you have a workout that doesn’t go as planned, don’t despair. I’m guessing even elite runners miss the mark every once in a while. (I’ll be sure to ask Kara and Shalane next time we do lunch.) Get back out there and keep putting one foot in front of the other. Life will go on! This is definitely one of those running-imitates-life scenarios. In life, there will always be things that go wrong. You’ll be disappointed when something that doesn’t go the way you expected. You’ll fail to reach a goal you’ve been striving for. It’s a fact of life. Imperfection is unavoidable when we are imperfect people living in an imperfect world. But instead of rolling over and giving up when things get tough, if you find a way to work through them, you’ll come out stronger and smarter on the other end. Have you ever had a “crash and burn” run or workout? What helps you to shake it off? 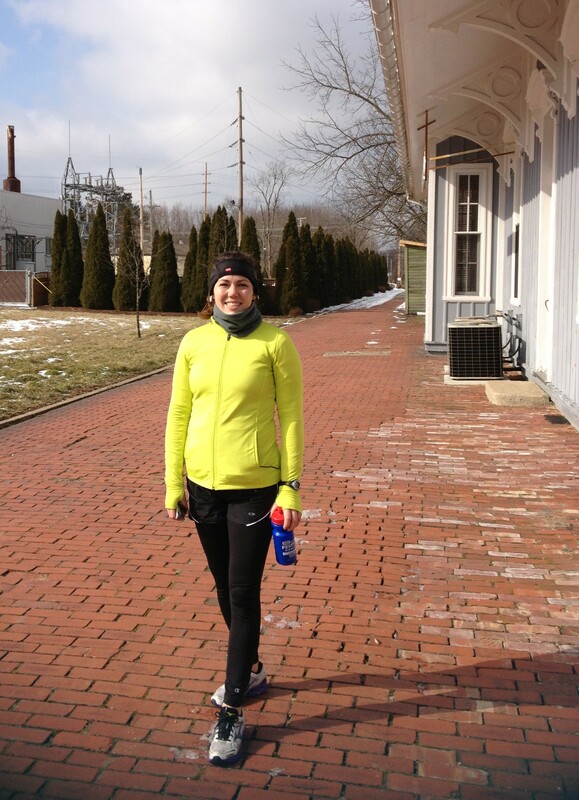 The author is a wife, mother, and solidly average “middle of the pack” runner from Northeast Ohio. Ok, maybe it’s not an Oscar. But as much as I like to think I write my blog simply for my own sake, it is very gratifying when I receive positive feedback … or any feedback … that tells me that someone else has taken a few moments out of their day to read my musings. So I’d like to thank the lovely ladies at We Shall Have Pie for nominating me for a Liebster award! What exactly is a Liebster award? The name comes from a German word that means something (or someone) that is dear or beloved. In the blogging world, a Liebster award is for small-ish blogs that are highly regarded by fellow bloggers. No fancy cash and prizes, but a lovely boost of confidence nonetheless! One of my favorite jobs was as a barista at a family-run coffee shop. It still makes me sad that it went out of business! A bathroom in my house is decorated in scarlet and gray, complete with Ohio State Football wallpaper. The name of the Spirit Airlines inflight magazine (Skylights) came from me. There was a naming contest when I was an employee there, and I won … Although in typical Spirit Airlines fashion, they jipped me out of my prize. I am very afraid of large birds, such as geese, peacocks, and chickens. That’s right, I said chickens. I like to read historical fiction, especially novels set during the U.S. Civil War. I also hate bacon. The smell grosses me out. I know this may make me very unpopular, but please don’t stop reading my blog because of it! When I was young, I went through a ballerina phase. My all-time favorite movie is “Rudy” and I like to watch it the night before a big race. Have you ever traveled to another country? — Yes! Canada, Mexico, various Caribbean islands, and several countries in Europe. Switzerland is my favorite! Do you enjoy dressing up for special occasions? — It may surprise a lot of people who think of me as a tomboy, but I do love to get dressed up. If you run what is your favourite season to run in? — I am really enjoying my winter runs this year, but autumn is my favorite. Cool breezes, crunchy leaves underfoot, and the smell of bonfires! Do you play an instrument? — Technically, yes. I learned to play the piano and the flute, but I wasn’t that good at either. Do you drink pop? — Very, very rarely. Maybe once a month. What is your shoe size? — Somewhere around an 8, give or take. My feet changed shape after both pregnancies, very frustrating! What is your Favourite Disney character? — I am not really a big Disney fan. When they create a princess that runs marathons, she will be my favorite. Do you have any tattoos? — Nope, although I have some pretty decent scars from trail running and biking accidents. If you could choose an age, what would it be? — Any age where someone would expect me to take a nap every afternoon. Which one would you do? rock climbing or wind surfing? — Both … but not at the same time. What is your favourite type of pie? — Apple, no contest. If you could live in any historical time period, which would you choose? How many cups of coffee do you drink on an average day? Brussels sprouts: Delicious or disgusting? What is your favorite beer? Or, if you don’t drink beer, why not?